We could probably come up with a pretty long list of traits that make the BlackBerry Passport an unusual smartphone. The operating system's peculiarities, the physical, touch-sensitive keyboard, and the bottom-placed stereo speakers would all be on it, along with the square-shaped touchscreen that it sports. This post, however, is all about the latter and how it compares, size-wise, to the screen on a smartphone that you might have heard about, the Apple iPhone 6. First, some technical characteristics: the BlackBerry Passport has a 4.5-inch, IPS LCD touchscreen with a resolution of 1440 by 1440 pixels for a PPI figure of 453 pixels per inch. On the iPhone 6 we find a 4.7-inch, IPS LCD touchscreen with 750 by 1334 pixels of resolution, which produces 326 PPI – quite lower than the Passport's. This paradox, if you will, occurs because we're used to looking at diagonal lengths when we compare screens in size. But at the same time, their aspect ratios are rarely taken into account, and these ratios, in some cases, differ from one screen to another. 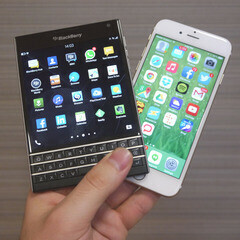 For example, the BlackBerry Passport's display has a ratio of 1:1, which is, basically, a square, while the screen on the iPhone 6 has a ratio of about 16:9, like on a modern TV. And the lower a screen's aspect ratio is (read: the closer its shape is to a square), the larger its area is for its diagonal size. That's why the iPad mini's 7.9-inch display, with a ratio of 4:3, is larger by area than the displays of most other 8-inch tablets around, which have 16:9 or 16:10 ratios. We're not trying to convince you that the BlackBerry Passport has a better screen than the iPhone 6 because of its unorthodox proportions. That's a subjective matter and depends highly on the user's needs and preferences – with its screen shape, the Passport is more suitable for things like reading emails, browsing the web, or editing documents, while the iPhone 6, with its wide screen, is better at displaying videos and photos, not to mention that it fits more easily in a pocket. We just wanted to point out that specs can be misleading at times, and that one has to look at the entire picture when comparing phones by their hardware specifications. Now feel free to drop us a comment below if you learned something new today. a simple trigonometry.. want to know the dimensions of the phone screen's width or length? use pythagorean theorem. doesn't know Pythagorean Theorem? Use the trigonometric functions: tan, sin, cos.
Not to mention passport has already taken into keyboard, while iPhone's on screen keyboard takes half the screen. Damn! Fun fact an 9,7" iPad is 7,6% bigger screen than a 10,1" android. Actually, this isn't true. The screen area of a 9.7-inch iPad is 45.17 square inches, and the area of a 10.1-inch tablet with a 16:10 ratio is 45.85 square inches. On the other hand, the iPad mini has more screen area than an 8-inch Galaxy Tab. It is less narrow. Therefore, the 12-inch display on the Surface 3 has more area than a 12-inch notebook display. On the other hand, a 13.3-inch notebook display would still be bigger by area. There are online calculators that can do the math for you. Nick T: too bad you didn't include the comparison between the Passport screen and the iPhone screen with its VKB showing. I think at least a mention of that would have been great in the article. Its unfortunate that the isheep will never know the brilliance of the passport let alone Blackberry. Considering that BB was around before the iPhone, a lot of iPhone users have had them, so most of us know what we're "missing"..
OS10 is nothing like OS7 so there's a lot that you're missing. But your statement is true, I'm sure y'all still miss security and a functional messaging system. I have used an Apple II, so I don't need to try a MacBook Air to know what i'm "missing". You've obviously never used a BB10 device before, nor do you even know the difference between BBOS7 and BB10, judging by your comment. @cmy1860 BlackBerry's old management is to blame for your comment. They didn't promote the fact that BB10 is a brand new operating system. So like yourself, people only think of BB7. Trust me, BB10 is brilliant. A true multitasking dream. Really glad Chen came along and is making headway in this regard. I don't know who devised this formula of diagonal length. the passport definitely has a bigger screen and due to the Aspect ratio even feels much bigger than iC6. The diagonal measurement is a wrong way to calculate screen size. iCraps have always had the smallest screens. My S Advance even though being 4" had a bigger screen (and always felt) than an iC5 with 4" diagonal. This less width formula gives Apple some way to save more money and RIP apart the brainless. Apple only went to a 16:10 ratio when they went to a 4 inch screen with the iPhone 5. Before that, they had a 4:3 ratio. They didn't do it to give less screen, they did it because a 4:3 ratio 4 inch and bigger diagonal screen would be unwieldy because of width. Though I prefer 16:9 or 16:10 because HD content like movies and TV fills more of the screen than it would on 4:3, and doesn't look all shrunk down. Fatexo just schooled you, dude. You were wrong on both accounts. Why you have to compared to iphone 6, and NOT galaxy s5 or Xperia Z3 or LG G3 or Nexus 6 (or Nexus 5)? Because it's a fun fact, that the iPhone having a bigger diagonal has less display area than the Passport. The other phones the bigger the diagonal the bigger the area. Nexus5 diagonal=4.95, area=10.47 GalaxyS5 diagonal=5.1,area=11.11 XperiaZ3 diagonal=5.2, area=11.53 LG G3 diagonal=5.5, area=12.93 Nexus6 diagonal=5.95, area=15.16 It could be a little more fair to compare with phones with same diagonal size Moto G diagonal=4.5, area All measures in inches for diagonal and square inches for area. It could be a little more fair to compare with phones with same diagonal size MotoG diagonal=4.5, area=8.67 MotoX (2013) diagonal=4.7, area=9.46 Even the MotoX has less display area than the Passport, but more than the iPhone6. The MotoG has "a lot" less than the Passport being the same size... in diagonal that is. What about the OS kills the phone? Everyone who uses BB10 on a regular basis raves about it. If it's apps you're talking about, it has BB World, Snap, 1MobileMarket, Amazon App Store and probably some others. Plus keep in mind that the phone was built for work use, not consumer use. Spoken like someone who has no idea about anything concerning BlackBerry 10. I agree with ablopez. Please tell us what it is about BB10 that kills the phone? If you've ever used BB10, then you would know that the BB10 OS is what makes the device awesome. @silencer271. I was at a PAN AM GAMES conference today in Toronto. As we had a meet and greet going table to table throughout the hall, every table had at least two owners of a BB10 device. (mostly Z30) Having my Passport on hand generated a ton of conversations about BlackBerry. Never once did anyone complain about BB10. I've used the Passport for just over one month and can't say enough positive things about it. Honestly, now when I pick up my wife's usual shaped phone, it feels like an outdated way to view and get things done. There is something about never having to pinch zoom. The other big factor is using the physical keyboard to scroll while viewing web pages etc. You fingers never get in the way of viewing and you never hit links by mistakes. These are all things you only appreciate after a few weeks on the Passport and BB10.